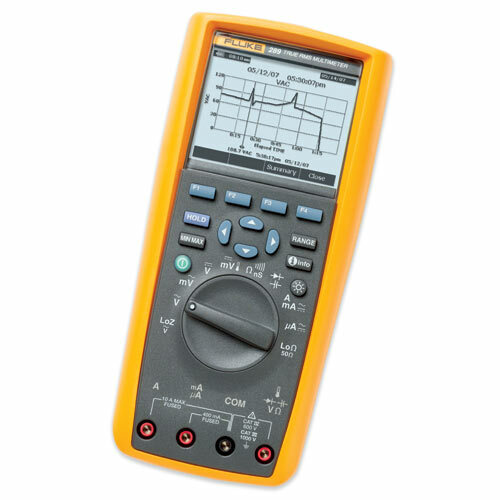 The Fluke 289 is the next generation high performance industrial logging multimeter designed to solve complex problems in electronics, plant automation, power distribution, and electromechanical equipment. The TrendCapture logging function allows for unattended monitoring. Measurements are plotted as a single line to help detect signal anomalies over time, storing up to 10,000 readings. Using on-board TrendCapture, you can graphically view logged readings without a PC. (Software and interface cable optional). Unsure about a function? Press the "i" button for instant help. Low impedance voltage function prevents false readings due to "ghost voltage." 50 ohm range - useful for measuring and comparing differences in motor winding resistance, low ohm measurements, or other contact resistance. Two terminal 50 ohm range with 1 milliohm resolution, 10 mA source current. 8.75" x 4.03" x 2.38"